(How well) Did Juno provide any insight into the Flyby Anomaly? I ran across an old BBC article titled Juno: The spacecraft putting sling theory to the test — Why a probe passing our planet on its way to Jupiter might end a decades-old mystery, and reveal something completely new about gravity. 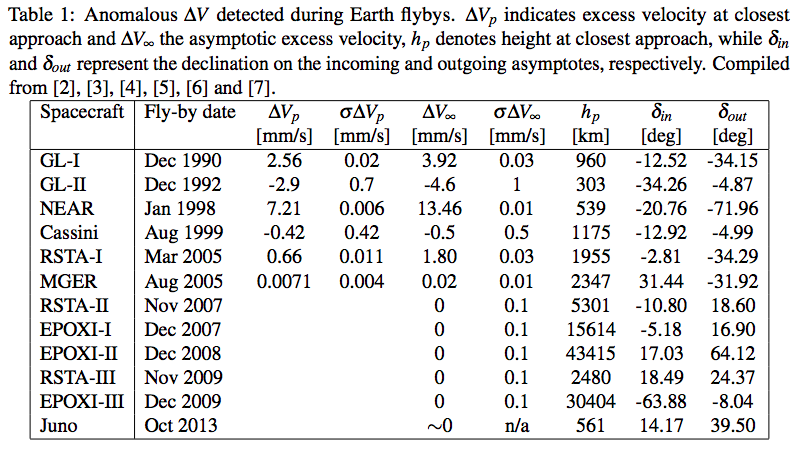 The Flyby anomaly is characterized as a very tiny difference between the measured change in velocity of a spacecraft after executing a flyby maneuver, and the calculated change, based on an exhaustively thorough modeling of all of the components to the gravitational field as well as all other non-gravitational forces have been modeled. The question Is the Flyby Anomaly still a thing? shows a nice table, and I've included it here as well. For Juno, the entry only shows ~0 with an uncertainty listed as not available. That there is a zero suggests that Juno did provide some information, but since the uncertainty is not available, it's hard to judge this significance. What is the nature of this zero? Did Juno help as suggested by the BBC that it might, or were there problems leading to unanticipated uncertainties? Below: From The Flyby Anomaly: An Investigation into Potential Causes. Note the anomalous difference $\Delta$ is much larger than the estimated error $\sigma$ for flyby's before about 2005. Browse other questions tagged orbital-mechanics physics flyby or ask your own question. Is the Flyby Anomaly still a thing? Will Earth, ISS, or Tiangong be the first habitat closest to Juno during Earth Flyby 2013? The plane of the orbit of Juno around Jupiter is not the ecliptic plane. How did it get into this plane?